Etna (Sicily, Italy): After a more vigorous phase yesterday, the effusion of the lava flow into the Valle del Bove and explosive (strombolian) activity at the New SE crater still continued this morning but have decreased in intensity. Last night the mild strombolian activity picked up to become intense. The lava flow from the fissure vent at the eastern base of the New SE crater is still alimented and descend towards Valle del Bove. After a steeply rising the volcanic tremor has dropped a bit but remains elevated. Gorely (Southern Kamchatka): KVERT had reduced the alert level of the volcano back to green on 23 Jan. Degassing and seismic activity had decreased significantly in December and remained at low levels since. KVERT writes: "Activity of Gorely volcano decreased significantly on December, 2013. Volcanic tremor is not registering from December 12, 2013. A temperature of thermal anomaly decreased to minus from December 12-15, 2013. A thermal anomaly was not detecting over the volcano in January 2014. But weak seismic activity of Gorely volcano continues because it is the active volcano. 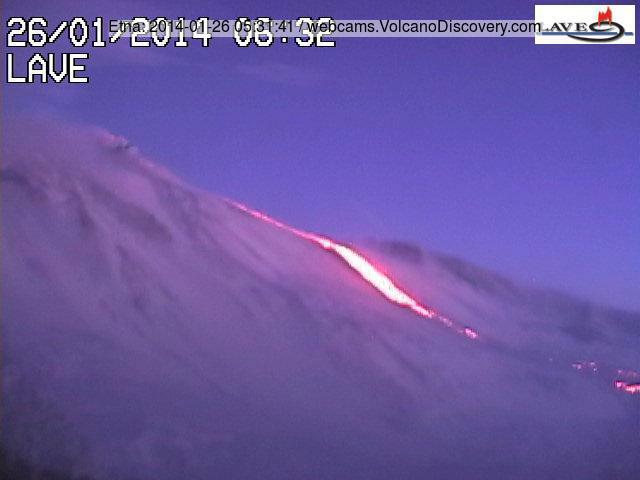 Video data showed a weak or moderate gas-steam activity of the volcano." Klyuchevskoy (Kamchatka): A new eruptive phase appears to have started at the volcano. VAAC Tokyo reported continuous ash emission and an ash plume drifting north at estimated 16,000 ft (5 km) altitude. Nishino-shima (Volcano Islands, Japan): The volcano continues to enlarge the island with lava flows, but seems to have increasingly explosive activity as well. Ash plumes to altitudes of 4,000 ft (1.2 km) were reported during the past days. These could have originated from more violent water-magma interaction (phreatomagmatic activity) or simply stronger strombolian explosions. Santa María / Santiaguito (Guatemala): Activity has remained essentially unchanged. The lava dome produces intermittent weak to moderate explosions (with ash plumes up to 500-700 m height) and abundant avalanches at the active block lava flow fronts, especially on the eastern and southeastern side of the dome. Collapses at these fronts can produce small pyroclastic flows. Pacaya (Guatemala): The lava flow emission from the southern fissure vent has gradually decreased or even stopped during the past days. Fuego (Guatemala): Activity at the volcano was characterized by weak to moderate strombolian explosions occurring at rates of 2-3 per hour. Abundant incandescent material is ejected and forms avalanches on the upper slopes.